The aorta is the blood vessel responsible for delivering blood from the heart to the systemic circulation. 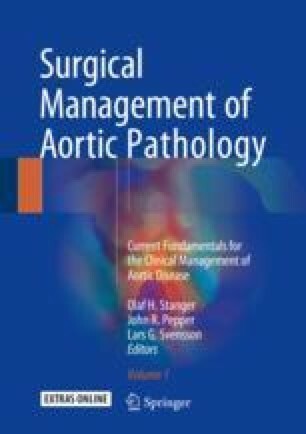 The aortic wall is a highly dynamic and tightly regulated structure that performs sophisticated functions in a unique haemodynamic environment, in addition to serving as a blood conduit from the left ventricle. Regulation of aortic wall homeostasis involves active mechanisms and interactions between its major structural components and specific regulatory pathways. Intrinsic contractile properties, combined with the elastic recoil capacity of the ascending aorta, optimize the shape and propagation of the pulse wave through the vasculature, an important determinant of the efficiency and distribution of blood flow. Active regulation of the size and shape of the aorta has a direct effect on systemic blood volume and pressure. The basic structure of the aorta depends on the interaction of elastic, collage, smooth muscle cells and ground substance. Changes in these lead to alterations in the size and function of the aorta. Age-related changes also occur which lead to stiffening of the aorta leading to an increase in blood pressure which is a feature of advancing age.